This Fully available, Newly Built One Bedroom, Luxury London Style Apartment sits within the Heart of the Exciting New Addlestone One Development which benefits from its very own 6 Screen Cinema, Waitrose Supermarket, Gym, Hotel and other retail units. 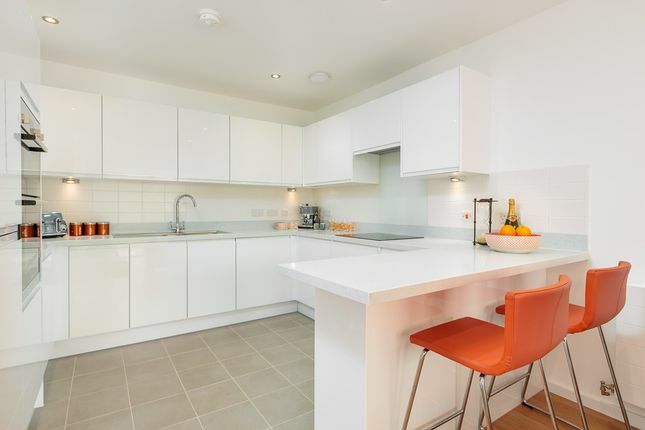 The Apartment boasts a spacious and Modern Gloss White Fitted Kitchen with Integrated Bosch Appliances as standard to include an Oven, Hob, Extractor, Fridge Freezer, Washer Dryer and Dish Washer. The Bathroom benefits from a stylish Bauhaus Suite to include a Panel Bath with Rain Forrest Shower & Screen Over, Low Level Integrated W.c and Vanity Unit, Chrome effect heated Towel rail, large Mirror, electric shaver point and ceramic tiled floor. Both the hallway and lounge have oak effect laminate flooring and the bedroom is carpeted for your comfort. All apartments at Addlestone One are available to purchase with the Governments 20% Help to Buy Scheme if needed. Property descriptions and related information displayed on this page, with the exclusion of Running Costs data, are marketing materials provided by RBC Investments (Surrey) Limited - Addlestone One, and do not constitute property particulars. Please contact RBC Investments (Surrey) Limited - Addlestone One for full details and further information. The Running Costs data displayed on this page are provided by SmartNewHomes to give an indication of potential running costs based on various data sources. SmartNewHomes does not warrant or accept any responsibility for the accuracy or completeness of the property descriptions, related information or Running Costs data provided here.